I am just wasting time on an airport in Malaysia and read some bizarre news on some Dutch website. It seems thieves in the Netherlands are currently very fond of build in navigation systems. The latest way of opening the vehicles is far from subtle … They ‘simply’ cut a hole in the side of the door, cut a cable that runs trough the door and is hooked up to the alarm system and open the door. 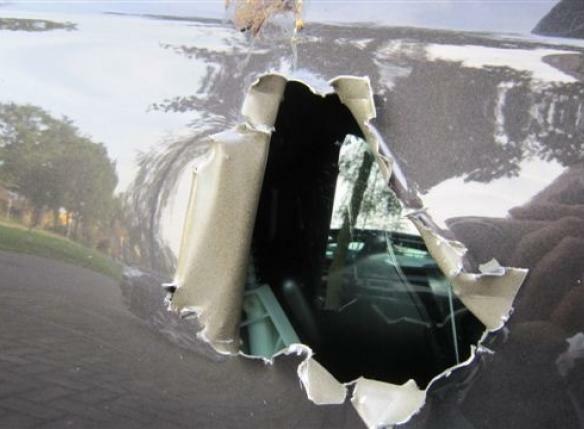 According to the website ‘Over Eindhoven’ the thieves cut holes in at least 62 verhicles! More shocking images can be found at OverEindhoven…. This entry was posted on Saturday, October 16th, 2010 at 17:22 and is filed under Uncategorized. You can follow any responses to this entry through the RSS 2.0 feed. You can leave a response, or trackback from your own site. That would not work in the US, as most of the cars have either a proximity system, a level-based movement system, a touch sensing system, or all three. Of course, most do not have alarms, and anyone with any brains does not have their navigation system out. Perhaps a navigation tracking system would be in order. you already have a GPS, why not add a simple radio access system, with the additional feature of cell-based updates. VW has no clue how to build proper alarm system.. These cars use navigation systems that are universal. Hondy Civic Hybrid’s are attacked a lot (see http://i34.tinypic.com/sllfs1.jpg ) for the same reason: they have a standard 2-DIN system. If you have a non-standard navigation system, you’re a lot safer. I dont think they cut this hole, close inspection of the photo shows no cut edges, the metal is just ripped open, some kind of claw tool and for the parts that are curled back like a sardine tin lid, perhaps some kind of plier. probably start the hole with a sharp point driven into the metal, either a tool and hammer or some kind of rock hammer. however they just expanded the hole to find the wire, they do not have a good template for locating the exact place to find that wire. Whatever the tool, I suspect that it works very quickly. thats the usual thieves plan. Entries (RSS) and Comments (RSS). 49 queries. 0.410 seconds.